The best part of this year has been spent setting up our new online diet programme. And I can’t wait for it to go live which, fingers crossed, should be very soon. In the meantime, here are some tips on how to get your body efficiently fat burning and your energy levels to soar (taken from my recent article in Natural Health magazine). I’m completely consumed with diet, health and nutrition at the moment. It has filled every waking moment for the last six months. Nutritionist Fleur Borrelli and I are working to transform The In Sync Diet book into an online programme. It’s been great revisiting and updating every aspect of our diet, looking at the latest research and trying to set everything out in the most accessible, easy to follow form. We’ve also shot lots of videos to help people along the way. However, there’s one aspect that still surprises people, although it’s not at all unique to our diet. For many years people have been told to eat little and often to keep blood sugar and energy levels up. I myself used to eat this way before I met Fleur, but this was without much success, as my energy would keep dipping and I felt tired most of the time. There’s a reason eating this way not only doesn’t give you energy, but in fact depletes it. And is the very reason we suggest doing the opposite on the In Sync Diet. The process of digestion uses a lot of chemical energy. The body needs to produce saliva, stomach acid and digestive enzymes to digest the food and absorb nutrients from it. The pancreas also needs to produce insulin which takes glucose to your cells for energy. It’s all rather hard work, so it stands to reason that if you’re eating every few hours you’re going to feel tired. The other important thing to know is that by snacking and not leaving a good gap between meals, you are preventing your body from tapping into your fat stores for energy. Instead you are constantly topping up your glucose stores and burning sugar instead. We have found the best way to lose fat and increase energy is to reduce meal frequency. On our diet we start people off having three meals a day with no snacking and then move them toward having two meals a day. When I switched to this way of eating my energy levels went through the roof. People have become frightened of being hungry but it’s ok to feel this way. Our genes have not evolved much in the last 50,000 years. Hunger is a sign to get moving and forage for food. When our ancestors were hungry they moved first (to find food) and then ate. In other words, we are designed to exercise on an empty stomach. This is the very best thing you can do to switch your body from being a sugar burner to a fat burner. Burning fat will help increase energy levels as well and allows you to exercise for longer periods of time. In fact endurance activity becomes easier when you train on an empty stomach. Aim for no more than three meals a day with no snacking in between. Leave at least five hours between your meals. Eat after you exercise, not before. If you eat breakfast and then exercise, you will simply be burning off part of your meal rather than burning fat. Eat foods that support your mitochondria (the fat burning part of your cells) – such as coconut oil, avocado, spinach, pomegranate, blueberries, seaweed, almonds, wild salmon, olive oil, mushrooms, mango and broccoli sprouts. Make sure your meals are a good size with a generous portion of protein, healthy fat, vegetables and a portion of fruit. You should be completely satisfied after you’ve eaten. 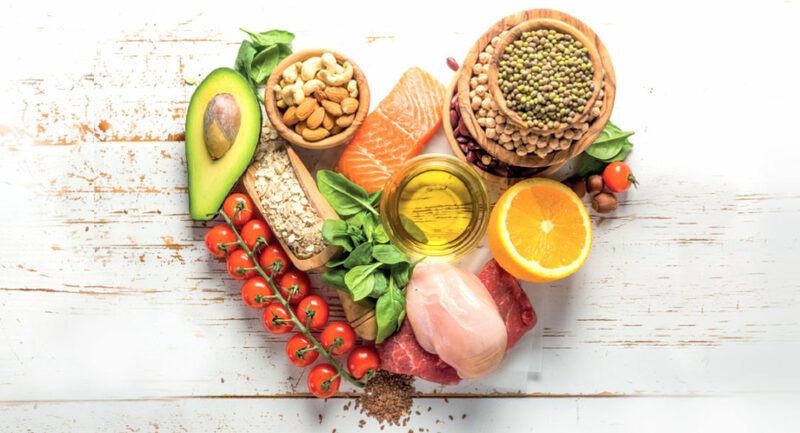 Since cutting out red meat I have lost weight and Iv got my waist line back again……the beauty is it doesn’t feel like you are on a diet……..but do I need to know whether I need to take B12 supplement? I’m wondering why you’re singling out B12? All the B vitamins are good for stress. It’s hard for me to know exactly which supplement would be right for you personally. 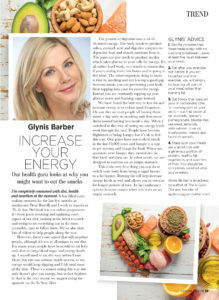 Do look under the Supplement heading on Ageless as there are some articles about which are the top supplements to take. When will In-Sync online go live? We are now looking at May. It has turned out to be an absolutely huge undertaking and we’ve added a membership hub so that people who’ve already done the programme or who just want to keep on top of their health and weight can join at a very affordable price. But I promise you, it’s going to be worth the wait. When I have a definitive date I will send in my mail out letter. In the meantime sign up on the landing page to get a discount.